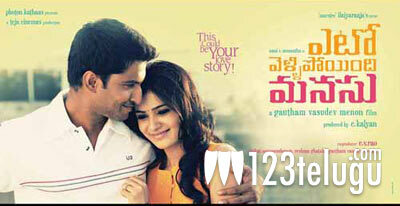 ‘Yeto Vellipoyindi Manasu’ is the latest offering from The Wizard of Romance! GowthamMenon. The Movie has Hit Pair Nani and Samantha in the lead. Maestro Ilayaraja is scoring Music for the first time for a Gowtham Menon film. Nani and Samantha are paired for a second time, right after the block buster hit of Rajamouli’s Eega. Gowtham Menon is renowned for his mesmerizing portrayal of romance and his brilliant imagery. Gautam Menon’s last movie Ye Maya Chesave with Naga Chaitanya and Samantha, is a runaway hit in Telugu. Noted Producer C.Kalyan is producing the YetoVellipoyindi Manasu in Telugu, under Teja Cinema banner along with Photon Kathas. The film’s music was just launched into the market by Sony Music, and is racing to the Top of the Charts already. The trailers of the two Haunting Melodies launched so far, ‘Ententha Dooram.. and Edi Edi have heart warming visuals and are going viral on the social media. In passing , Gowtham Menon has given several unforgettable melodies like ManoharaReema Sen, Abbas’s Cheli, Cheliya.. Cheliya..( Gharshana- Victory Venkatesh) through his previous films. With the Meastro’s musical genius at work,‘YVM’ s music is set to become addictive.Incidentally the title of the movie is after the famous song from theNagarjuna, Tabu starrer Ninne Pelladutha. Yeto Vellipoyindi Mansu is set to sway the hearts of audiences world wide, from October. KAD/iDream the brands which raised the bar for marketing of Telugu Cinema and home video products in Overseas markets , is planning a global release of the film, on a Grand scale. For trade enquiries, Please contact.